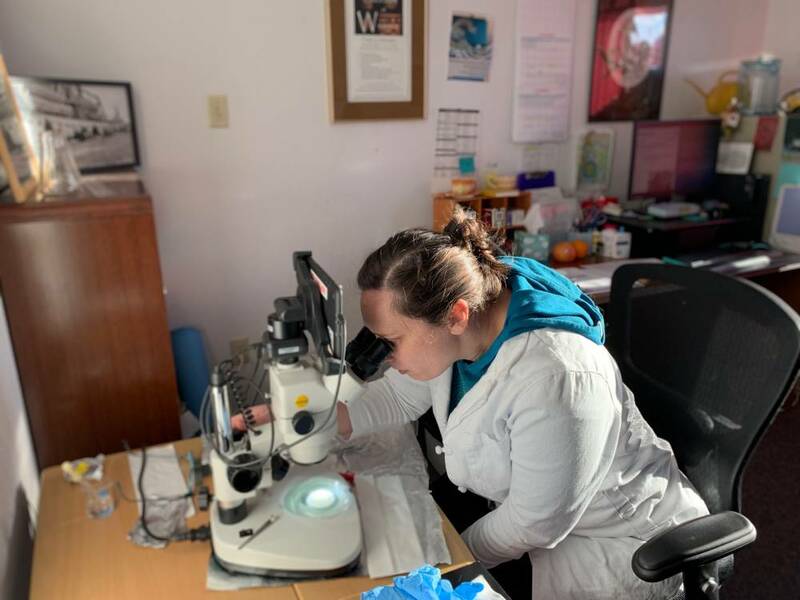 Researchers in Sitka have been looking at the impact of microplastics on local shellfish. Their findings illustrate a possible connection between microplastics in butter clams and household laundry. Helen Dangel sits in her office at the Sitka Tribe of Alaska research building. The fisheries biologist is dressed like one. She wears a white lab coat and looks at slides through a microscope. She’s got a sample from a butter clam in Starrgavin Estuary, with three small pearls inside — Pearls about a millimeter in size, so small you can barely see them with the naked eye. So probably not worth much. But that’s not what she’s trying to show me. Dangel is more interested in the small, hairlike microplastics. As the name suggests, they’re minuscule pieces of plastic debris littering the world’s oceans. Consumed by fish and wildlife, microplastics could have unhealthy consequences. The research into health effects from ingesting microplastics remain inconclusive. But nobody’s saying it’s good. That’s one reason why Dangel and fellow researchers have spent the past year collecting samples of two species- butter clams and blue mussels- looking for microplastics in the mollusks. In partnership with Mt. Edgecumbe High School and University of Alaska Southeast, they collected samples from Starrigavan Estuary in 2018. There’s been a nationwide backlash against one major source of plastic pollution: plastic bags. And cities in Alaska like Wasilla, Soldotna and Cordova have banned single use plastic bags. Anchorage moved to ban them last year though the roll out’s been delayed. Sitka flirted with the idea of a fee on plastic bags, though the assembly postponed action indefinitely. Dangel explains that plastic bags do break down over time – but they don’t really go away. After researchers collected the shellfish, they returned to the lab, measured the clams and mussels and then then separated their bodies from their shells. “We used potassium hydroxide to chemically digest the soft body tissue of the shellfish,” Dangel said. They put the flasks in an incubator shaker for 24 hours to accelerate the chemical digestion process. They discovered that, in both samplings, all of the butter clams and most of the mussels contained microplastics. Dangel says that the majority of the microplastics they found weren’t plastic fragments, they were ‘microfibers.’ They look like tiny hairs. Synthetic hairs. So where are they coming from? Dangel says they’re likely from synthetic fabricsl like polyester or nylon. How did they get into the ocean? It could be Sitka’s dirty laundry. Dangel says there are products on the market that collect microfibers to reduce pollution in the water supply. Microplastics are found everywhere. In both farmed fish and wild stocks caught in Alaska. Dangel said it’s not a reason to stop eating wild seafood. “If we stop eating our local salmon, are you going to buy a steak that is high in saturated fat and not as good for you?” Dangel asked. But with Alaskan seafood marketed as some of the most pristine wild-caught in the world, the research showing microplastics in shellfish is troubling. The next step, Dangel says, is to examine other species, like salmon. But for now she hopes her research will make people more mindful about synthetic fibers. Because microplastic pollution that goes down the drain doesn’t really go away.